Modena, a classy small city in Emilia Romagna for the next stop on the Taste Trails Rome Italian cooking course trip was Villa San Donnino and master craftsman of Traditional Balsamico, Davide Lonardi. Here Davide's traditional balsamico requires a minimum of 12 years to age, and the resulting product is absolutely the real deal: labour intensive, artisanal, small produce traditional balsamico. Precision timing, dedication and above all patience is required to produce what many people in the Emilia-Romagna region refer to as the “black gold”. This is the original sought after product; the artisanal take on the big bottles of thin black stuff found on supermarket shelves and poured over salads with extra virgin olive oil, salt, and black pepper. Traditional Balsamic Vinegar like the extra virgin olive oils of Sabina is a DOP (Denominazione di Origine Protetta), in English, Protected Designation of Origin, a way to immediately recognise Italian products that are produced by local artisans using traditional methods. In this case, traditional balsamico can only be produced in Modena and only contains one ingredient: grape juice (compared to the balsamic found on supermarket shelves is often blended with wine vinegar and additives for colour). It must also be aged for a minimum of twelve years, whereas most vinegar is aged for 2 years max. The result, a thick, rich black liquid that to taste is so complex and delicious, it puts the supermarket stuff to shame. Waiting 12 years to finish aging the first batch means Traditional Balsamic Vinegar production isn't exactly a start-up business. Davide was raised for Balsamic production, with his family's operation at Villa San Donnino now in its third generation, they use wooden barrels that date back more than three hundred years. San Donnino produces around 3,500 bottles of Traditional Balsamic per year. Around Modena, there are many small batch producers who produce as little as a 100 bottles, and then just a few bigger ones that produce up to 5,000 bottles per year. For over a half century of making balsamic vinegar at Villa Donnino means the quality of the Balsamico is of prime importance. Each year, Davide and his team harvest the grapes, which are then skinned and pressed into juice that is immediately cooked to stop the initial fermentation. The cooked juice, or must, is placed into large wooden barrels in the Villa San Donnino attic. In the Villa San Donnino attic, the aging grapes must into vinegar, then each year a system of decanting is used to transfer a small amount of the must from the larger barrels to the smaller ones. This process takes place each winter, the summer months are reserved for the fermentation process which occurs naturally in warmer weather. 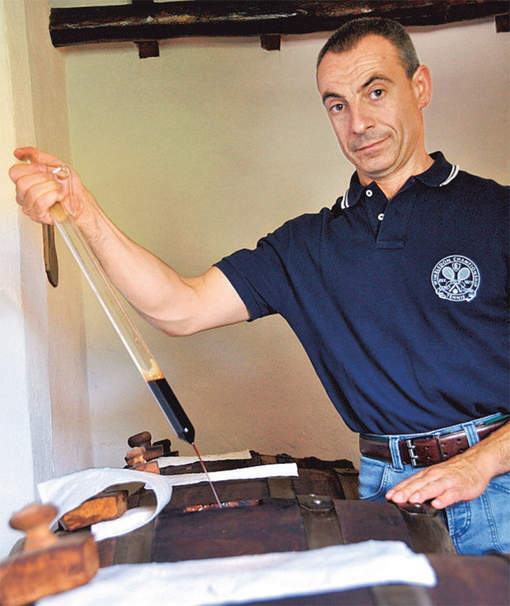 After either 12 or 24 years have passed, the smallest barrel is emptied and taken to the Consortium of Producers of the Traditional Balsamic Vinegar of Modena. Here, the product is reviewed by master tasters (the sommeliers of vinegar), and if approved, bottled into 100ml bottles. Only then can Villa San Donnino label be added and make the product available for sale. This laborious very strict process and the resulting incredibly high quality balsamico may be the reason why each bottle sells for a minimum of 40 euros. and also why Davide hasn't had a holiday since 1995. In a country like Italy, where history and tradition combined with innovation drive food production, and in a region like Emilia-Romagna that produces some of the world’s finest food products, Traditional Balsamic Vinegar continues to be crafted in the same way as for the last hundreds of years. This results in an incredibly unique and high quality product that stands out in a world where everything is instant and revolves around big supermarkets and fast food restaurants. The time, energy, effort and dedication required to make Traditional Balsamic Vinegar is a reminder that thoughtful, slow, and precise is almost always better. With Taste Trails Rome Italian cooking courses and holidays you will on a daily basis be tasting fine artisan produce. Want to experience for yourself traditional balsamico ? Well you can on our Italian cooking course and holidays . We run the Italian cooking course through out the year from March to November . A warm welcome awaits.